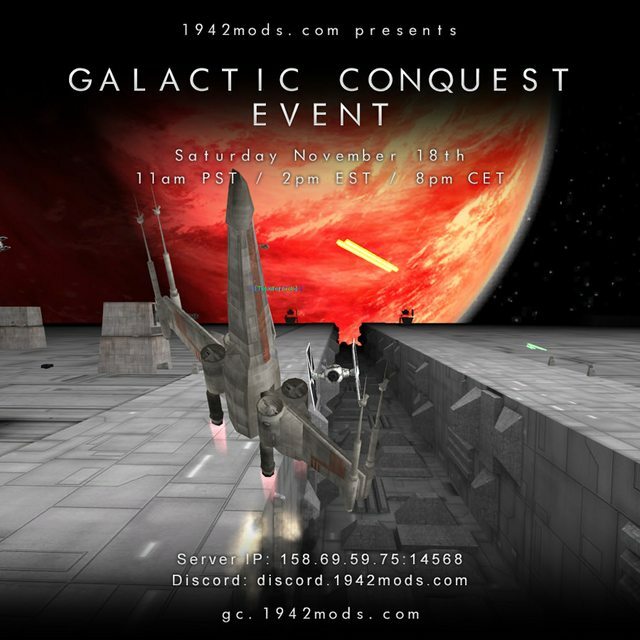 We're hosting an event for Galactic Conquest on November 18th. Thanks for setting this event, lots of buzz ! Remember folks , this Mod ONLY plays in Multiplayer. It requires a high player count. Please consider having a look if you have never seen it and showing some love for other Year End Events that modding communities may have! for some reasons it shows in game "gcmod 8.1" you can edit the ini file in the mod folder. hope everybody dl'd that mode - see u on the bat - hrmpf in the galaxy. Thank you for the feedback. The future 9.0 release will include this. This is a beautiful Legacy Mod, Thankyou to the players making it a point to visit when it comes around in events. Without you, it would vanish. For the fans, I know they aren't looking for an army.. Sustainability, Just a few more players to fill out the game. Well , I guess I'll be the messenger this round! Yes , yet another event for the old STAR WARS mod! Go enjoy the Movie in theaters then return to the game you love for a round of Galactic Conquest! These events are FULLY supported by the players. Be part of the Legacy! more weekly events please. It makes lot of fun with you last event!